Woolworths demerged from Kingfisher in 2001 and set off in a new direction. Rather than rely on in-house talent, new leaders were brought in from outside. Within weeks a new CEO initiated radical changes to both the target customer and the store range and layout. While his plan retained a substantial Confectionery offer, its display space was radically reduced to make room for more Toys and Clothes. The changing of the guard also applied in the Buying Office. For years Confectionery had benefitted from the stability of long-serving executives who had grown up in the stores, and had learnt the ropes as Assistant Buyer before taking the helm. They proved hard to replace. A younger Buyer was appointed, bringing dynamism to the role and quickly finding his feet, before being poached by a supermarkets seeking to develop its non-food offer and to benefit from the higher margin on seasonables. They hoped that the headhunting would allow them to draw on the High Street chain's expertise in building its core sweets and snacking business. The pattern was repeated three times, with each incumbent leaving in under a year. Tough times lay ahead, requiring a steady hand at the helm. Sometimes when you are at the top, as the market leader, the only way is down. The confectionery department went into the twenty-first century on top of its game. It held a dominant position in the market, as the largest in Europe. 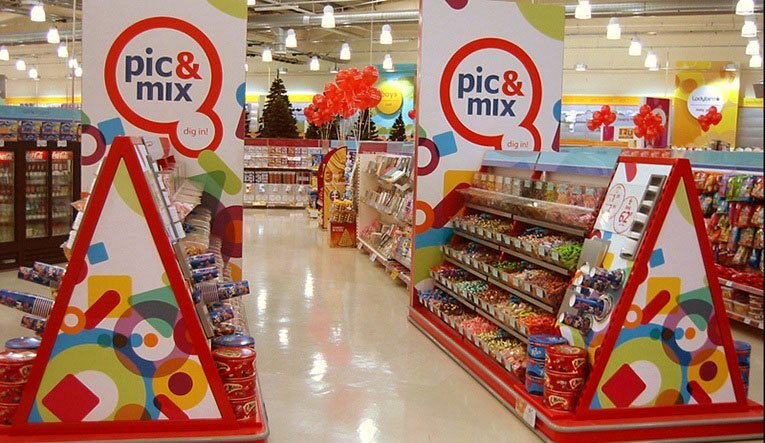 The whole chain had been dubbed "the pic'n'mix retailer", in honour of the iconic range. Just seven years it collapsed into Administration. The stores disappeared from the High Street just forty one days later. Today a trip to Germany, Jamaica or Mexico is required to buy Woolworths pic'n'mix. In 1999, a planned merger between the parent company, Kingfisher, and Asda failed at the eleventh hour, as the supermarket switched alliegance to Walmart. Analysts feared that the CEO, Sir Geoffrey Mulcahy, had passed his sell-by date. After many twists and turns Woolworths was 'set free' on the London Stock Exchange as the largest of a group of companies. The slow demerger process was painful and disruptive. It prompted many old hands to abandon ship, particularly after new talent was hired from outside to take charge. It fell to a new CEO, Trevor Bish-Jones, to set a strategy and take the business forward. His plan was radical. He decided to abandon the traditional everybody's everyday store approach to target mums and young families. He called the formula 'Kids and Celebrations'. The ranges of Toys, Kids Clothes, Party Products and Entertainment were expanded, at the expense of Home, Kitchen and Garden. Sweets remained a key component, but planners were asked to squeeze it into a lot less space. As the idea took shape, clothes and toys were moved towards the front of the store and entertainment demoted to the back. The CEO also introduced a 'seasonal space' in the middle of the store, which would avoid the need for major counter moves each season. Each of these steps ate into the space allocated to the staple ranges of sweets and pic'n'mix. 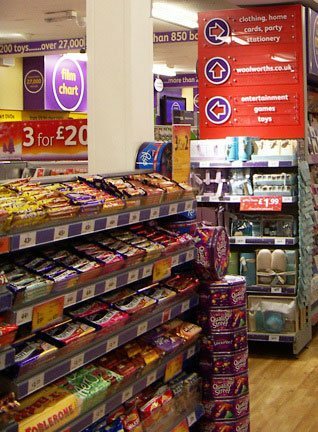 Every display was condensed, with best sellers like Cadbury's Dairy Milk trimmed from a whole shelf to a single row. This relied on the counters being replenished every few hours, which was not always possible. The large stores got a full makeover. This introduced attractive new pic'n'mix counters. The eye-catching look acted as a beacon for the compact sweet shop. 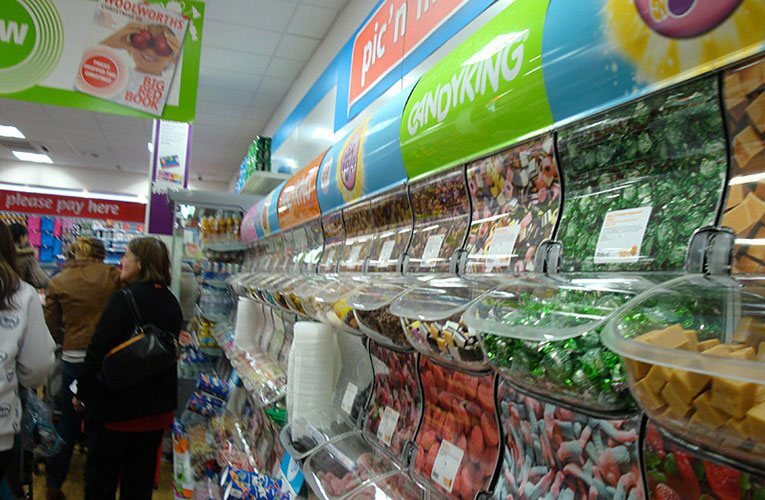 The modernisation helped to minimise a fall in sweets sales from the space reduction. But only 200 stores were updated. The 600 smaller shops changed layout with their old fixtures, and saw a sharp decline in the sale of sweets, particularly as a drive to increase margin basis points saw prices rise by around 2% compared with earlier times. The new formula attracted new loyal customers, but drove away lots of others. Between 2002 and 2007 a thousand less people visited the stores each day than the last, as some pensioners and those without small children began to visit less often, or opted to shop elsewhere. 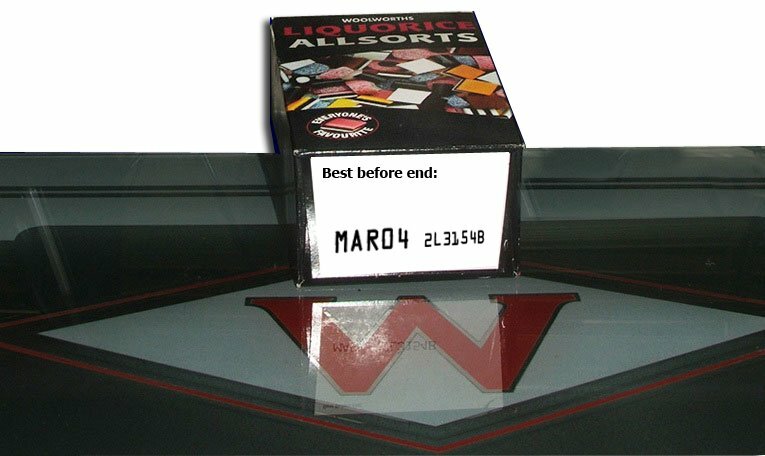 The decline was finally turned around in 2008, as many were enticed back by a new value range called 'WorthIt! ', which included a range of bagged sweets at jaw-drop prices. so the idea was ... dropped ! In earlier times the Buyer would have stood his ground, perhaps arranging a nominal credit for the occasional over-full cup or arranging free sample stock in compensation. 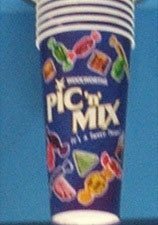 But Pic'n'mix had five different Buyers between 2002-6, with none lasting more than twelve months. Most were poached to take on similar roles with the supermarkets. The confidence to fight opposing views at Board level tends to come with experience. It is little wonder that people new to the role simply went with the flow. In 2004, as work to convert the larger stores to the new look continued, the chain dabbled with a new shopfit for the smaller branches and the much larger out-of-town 'Big W' Superstores. The small stores had already adopted the new Kids and Celebrations layout. Despite new fixtures and a loud new colour scheme, the sweets offer went largely untouched, save for the pic'n'mix being squeezed onto an island counter to save precious wall space. The big idea behind the overall modernisation was to offer an extended range of products to order. This included only a few confectionery lines. A trial group of Big W' stores were rebadged Woolworths and fully refurbished with a new look inside and out. Intriguingly, while the range of sweets went unchanged, the pic'n'mix counters got a radical re-design, along with a new brand name on huge signs. The rationale behind changing the spelling was never explained. The amendment was dropped before a cheaper version of the modernisation was applied to the remaining stores. With increased competition from the supermarkets and mediocre results from the investment in a new store look, the focus turned to new channels to market. The woolworths.co.uk website grew its sales from under £10m to £70m a year between 2004 and 2007. Meanwhile the pic'n'mix fixtures in the unrefurbished stores were in poor condition and there were insufficient funds to replace them. Despite this, many were surprised at the remedial action pursued by the CEO. After a tradition spanning 120 years in which Woolworths pic'n'mix had become legendary around the world and a signature range, he opted to outsource the entire range. He had engaged Candy King, a British firm which had helped the supermarkets to break into the weigh-out sweets market with an out-of-the-box solution. Its representatives would install and merchandise new counters to its own design. There would be no up-front cost, and as a concession the supplier had agreed to incorporate a small selection of popular lines from the existing suppliers into its overall product offer. Bish-Jones argued that not only did this sort out the ageing fixtures at a stroke, but in the long term it would also generate more profit. Whatever the rights and wrongs of the decision, despite the minor range variations, at a stroke the Woolworths offer had ceased to be discriminated from the identical displays in supermarkets and cinemas. 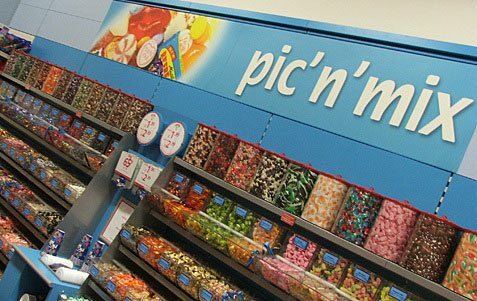 Even the words 'Pic'n'Mix vanished from the counters, until a backlash prompted a few cornice signs to complement the Candy King branding. Some would argue it was the beginning of the end. Within three years the shops had vanished from the High Street, and shoppers seeking genuine Woolworth Pic'n'Mix would have to travel to Germany, Jamaica or Mexico. The range certainly got 'the TBJ treatment'. Ironically, once upon a time Frank Woolworth was nicknamed the Candy King.